Meanwhile Reuters have quoted Sher Aziz Kamawal, a senior police commander in Kunduz, that two of the security personnel were involved in the insider attack whose search is underway. The attack is claimed by the Afghan Taliban spokesman Zabihullah Mujahid in a statement released for media reporters. He has told that Taliban have taken the arms after over running the check post. 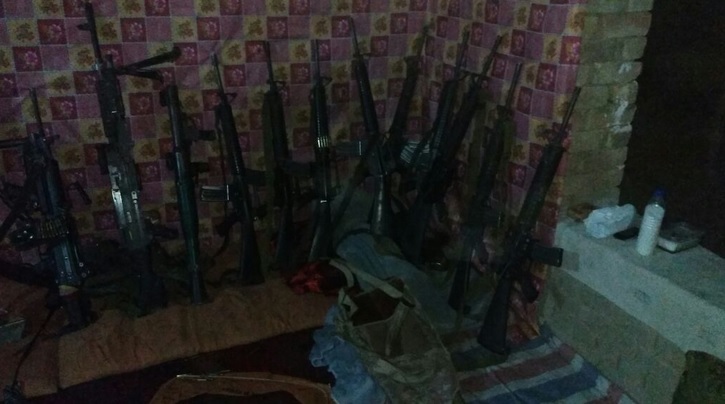 The spokesperson has also released photos of the arms cache. Kunduz the Afghan province that Taliban ran its head quarter last year in a massive attack but was later regained by Afghan Security Forces. On the other hand the Ministry of Defense of Afghanistan has told they have killed 67 militants across “Nangarhar, Laghman, Ghazni, Paktia, Kandahar, Uruzgan, Ghor, Kunduz, Jozjan and Helmand, including a regional militant commander Salim in Ghazni” in last 24 hours. The Ministry of Defense statement reads that 7 of the Afghan National Army personnel have also lost their lives in these operations. The insider attacks always come through the angry Afghan security personnel or influenced personnel who later join the Taliban ranks after committing such attacks. Sometimes the Taliban linked security personnel pass on information to Taliban that pave ways for such attacks. Earlier the Coalition Forces were targeted in the same sort of Taliban insider attacks, called “blue on green attacks”. Such inside attackers would target the NATO forces and officials when they were training the young Afghan security personnel.